How old is Tanjung Nangka? Sometimes it's surprising how long some of our villages have been inhabited. We know for a fact that along Sungai Brunei, the Kota Batu areas, Bruneians have lived there for hundreds of years. But for the most parts, most of the interiors of Brunei are not habited by anyone until very recently. Of course, there are some natives which live earlier in the interior parts of Brunei. However it is debatable as to when they started. I read with interest a recent Museum report about the excavation work which they did at Kampung Tanjung Nangka. The excavation was done along the Damuan River. Damuan River is about 2 kilometers away from the main road Jalan Tutong. 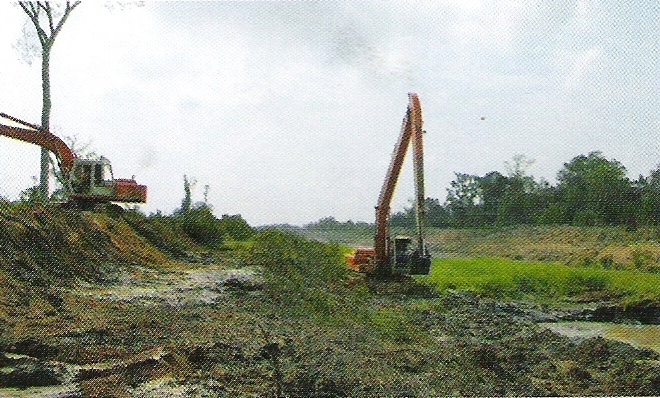 The Damuan River was recently widened and a lot of dredging was done along the river bank. The sands that were dredged were placed alongside the riverbanks. Among the sands, many shards of potteries were found. In fact up to 5 boxes of broken pieces were actually found where the majority of these were potteries of different types. They have been identified as coming from the Sung Dynasty (960-1279), the blue white potteries from the Ming Dynasty and also the Ching Dynasty (1368-1912). What was pretty clear is that the area around the village has been inhabited a very long time ago which is roughly around the 10th to 14th Centuries and continued until at least to the early 20th century. In those days, rivers are the main communications and transportation channels, it is not surprising that there are settlements as far inland as that found in Tanjung Nangka. However judging by the amount of potteries found which is considered as small by archaeology standards, it is more likely that the settlements there were very small. But it still indicated that the area around there despite the fact being considered far to some people have been settled, if the potteries evidences are correct, about 1,000 years ago, and that's how long people have been living in Tanjung Nangka. PS. I wrote about the Telaga Raden Bisa - the well that can heal, that was said to be in the village in an August entry. The BB yesterday had an article about a school principal who had been writing children story books based on events of the village. Why 5 Times a Day? Reality of Brunei Married Life?